The sun has finally set on summer, and it’s time to welcome the invigorating freshness of fall. This season is bursting with glorious colors that entice us to spruce up our home décor to follow suit. Here are some ideas on how to adopt the wonderful bounty of Mother Nature to cozy up your home. 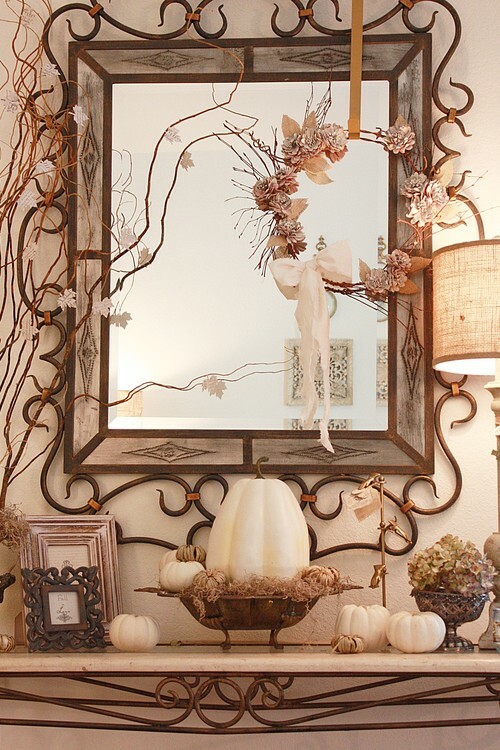 Decorating with fall flora takes very little effort since the foliage is already stunning all on its own. Start off by welcoming guests with an entry table topped with a lovely arrangement of leaves and branches in a large vase. 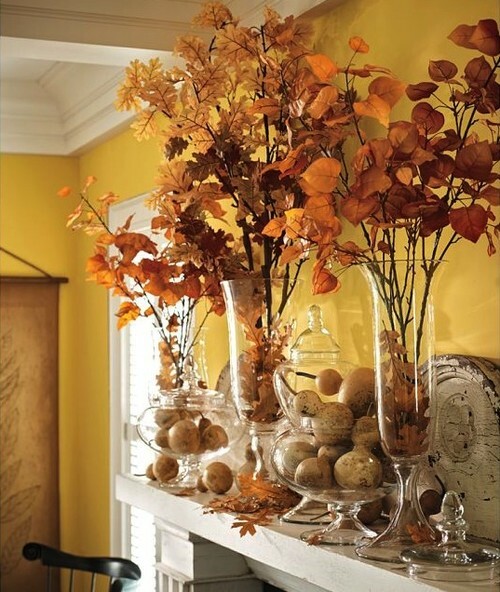 Use a combination of scarlet maple leaves, golden ginkgo, or bittersweet branches to give your foyer a colorful and cheery ambiance. Complement the arrangement with some fruits in an earthenware bowl and an inviting bottle of wine for maximum impact. Lifelike faux leaves work just as well and last much longer than real branches. 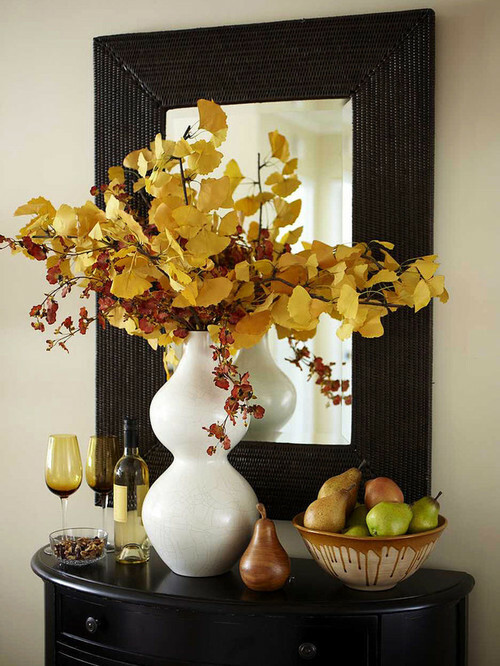 Place tall artificial golden-brown maple leaves in tall glass vases, and perch them on the mantel alongside glass bowls filled with gourds, acorns, or pinecones for a striking statement. 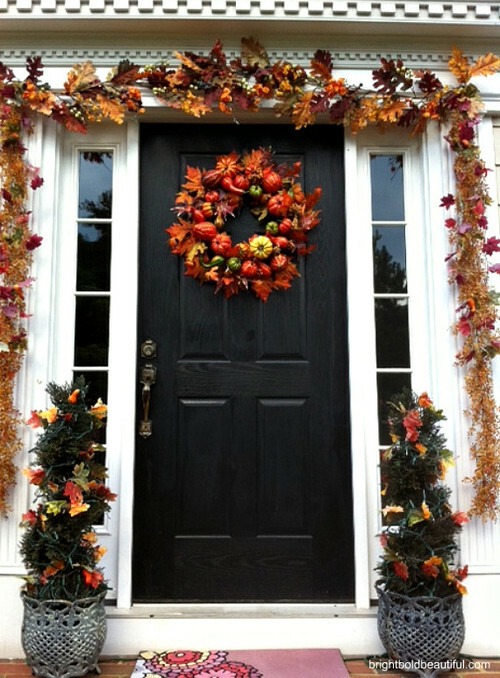 Adorn your entryway with festive décor that gathers all the goodness that autumn has to offer. Get a wreath that shows off the elements of a fruitful harvest, such as those embellished with mini pumpkins, green apples, and persimmons. Pair it with a seasonal garland made of multicolored maple leaves, sprigs of crabapple, and bright berries for a show-stopping display that remains cheerful all the way to Thanksgiving. If you’re a “crafty” character, try your hand at this simple DIY wreath project from Crafty Sisters. Decorated with berries, pine cones, and maple leaves, this festively plump homemade wreath adds a lot of fall flair to your front door. A classic fall favorite, pumpkins make for a fun and colorful focal point for your seasonal decorating designs. For an easy and rustic centerpiece, place some dried moss on a glass cake platter and top it with a bright orange pumpkin. 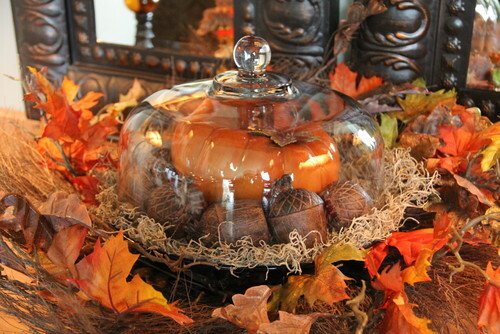 Surround the pumpkin with wooden acorns and sit the platter on the center of an autumn wreath. Piece of cake! White pumpkins, once a rare novelty, are quickly becoming a stylish alternative to the usual orange ones. Also known as albino or ghost pumpkins, these white gourds provide great contrast in traditional autumn displays. If you mix white pumpkins with other neutral-colored décor, you get a profoundly chic and elegant effect. If you want a fun and modern look for your pumpkin, a shiny chevron embellished pumpkin will be your best bet. This DIY project from Bright Bold Beautiful uses silver glitter and metallic silver spray paint to create a sophisticated piece that won’t scare away your holiday guests. Try out these stylish, nature-inspired decorations and make everyone fall in love with your home over and over again.